Laurence Freeman, OSB, is a Benedictine monk and Director of the World Community for Christian Meditation, a contemporary contemplative community with its base in London and with a presence in over a hundred countries. Before entering monastic life, Laurence worked in banking and journalism and for the United Nations. He travels widely as an international speaker and retreat leader. He has conducted dialogues and peace initiatives such as the historic “Way of Peace” with His Holiness the Dalai Lama and is active in inter-religious dialogue with leaders of other faiths. He teaches a course on Meditation and Leadership for MBA students at Georgetown University. He encourages the teaching of Christian meditation to children and students as part of the recovery of the contemplative wisdom tradition in the Church and society at large. Learn more about Fr. Laurence's work with the World Community for Christian Meditation. Fr Laurence's work in the MBA program at Georgetown's McDonough School of Business is discussed in the Financial Times. Fr Laurence's lecture on Friday night will be entitled Work: Sacred and Secular. On Saturday morning, Fr Laurence will lead us in meditation, give a brief talk and there will follow a panel discussion with three business people reflecting on how their work lives are informed by Benedictine practice and values. Now in its fourth year, the Annual Symposium on Benedictine Spirituality has become a vital and enriching series of gatherings for those who want to grow in their understanding of the balanced spiritual life informed by the Rule of St. Benedict. The donations of our Lead Supporters have made it possible for us to bring distinguished speakers from around the world to engage our hearts and minds in conversations about the life of prayer. 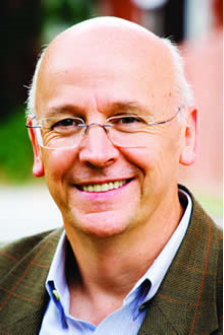 ​This year we are very pleased to present Laurence Freeman OSB as our keynote speaker. Father Laurence teaches Christian contemplative practices to students, business leaders, and general audiences around the world. Won’t you consider making a donation of $200 or more to help support the work of Friends of St. Benedict in presenting this Annual Symposium?